Gathering Spring Herbs, 1896 - Lovely triptych depicting upper-class ladies in the countryside gathering herbs in spring. In the center, a young girl kneels in the grass, using a knife to cut the greens and place them in her wicker basket. Her companion smiles happily down at her as a bird flies by overhead. An attendant shelters one of the beauties with an umbrella at right as they pause next to a cluster of young pine trees. 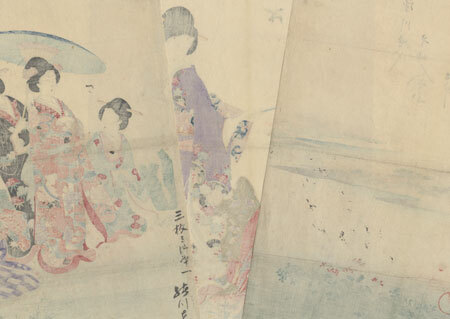 A beautiful design with wonderful color and detail in the attractive kimono fabrics, and a charming landscape setting with a river winding through the distance, clusters of pink and yellow blossoms coloring the banks. Includes burnishing in the black robe and embossing in the white kimono trim and pink sash. 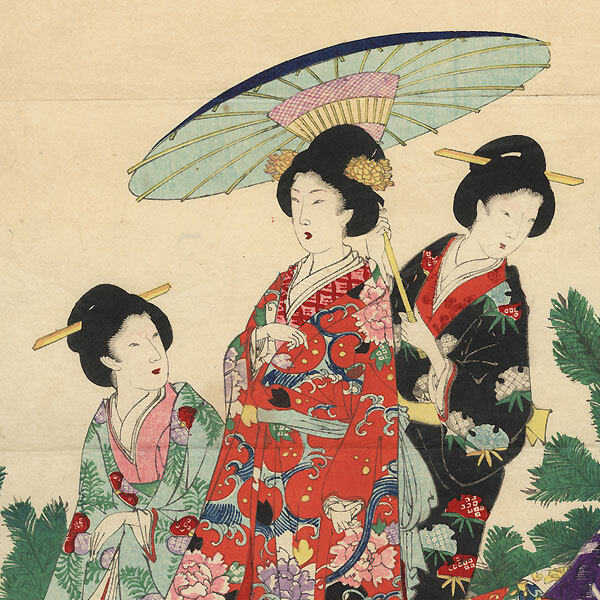 A rarely seen Chikanobu subject. Condition - This print with excellent color and detail as shown. Three separate panels. Horizontal folds. Small losses at corners, small tear at edge, repaired. Slight toning, soiling, and creasing, a few small spots and stains. Writing on reverse. Please see photos for details.